I first came to Whistler, BC for a ski camp when I was 14. When I came up the first time I was stunned by the place. It quickly became one of my favorite places on earth. Luckily, my family also fell in love with it and a few years later the family bought a time-share that we have been coming up to every year for the last 25 years. 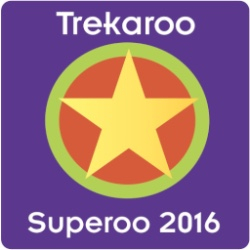 It is a trip we look forward to, not just to “live” in the village for a bit, but also the skiing and activities. One of our favorite parts is that we come up with my folks and we have 3 generations skiing together. That is a pretty awesome thing. Every year we come up I plan a new activity and/or dinner at a restaurant we have never eaten at so we can try some new things. Over the next few weeks I am going to highlight our newest favorites. I want to start out with our regular favorites. If you want to find their actual locations I am including the links for you as they will give the best instructions on how to get to each of my recommendations. We come up a week before my parents and usually stay at the Hilton, which has been a great home base for a few days of fun. We don’t have a kitchen at the hotel, and have to eat out and we have our favorites! For sushi, our go-to is Sachi Sushi. We find the fish the freshest and love their take on their rolls. I tried their Nabeyaki Udon this trip and it might be my new favorite udon. We also love their sunomono salads. If you are American, Canadian sushi restaurants tend to sell their nigiri by by the piece, unlike most of our sushi places. If you want 2 pieces, you will need 2 orders. My husband being English loves a good curry and we have a really hard time finding one he loves in the US. 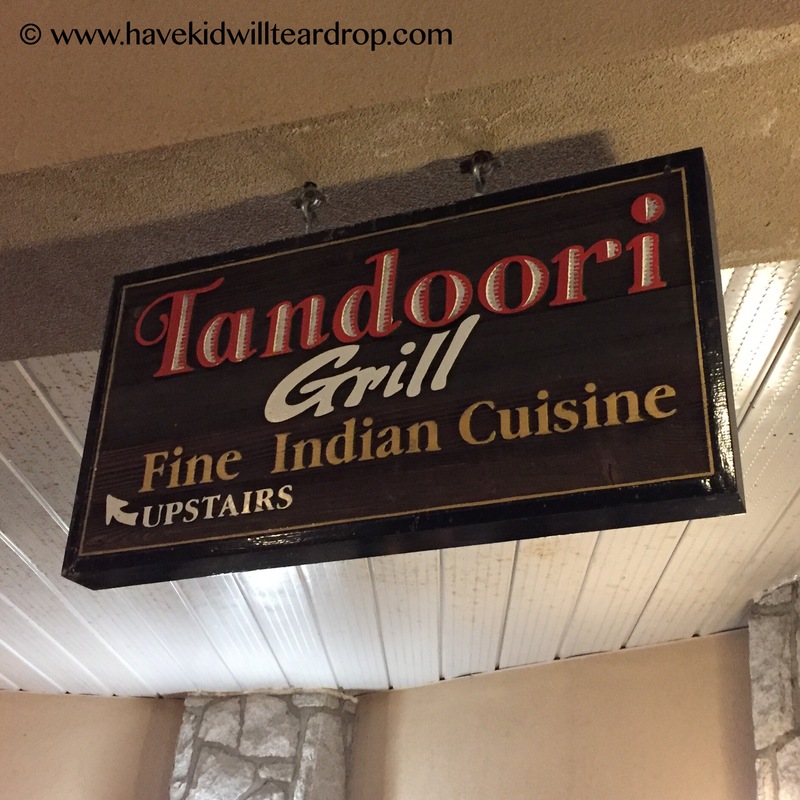 The Tandoori Grill is a “must visit” for us every trip. Their curry is very similar to what he grew up with in England and it gives him a taste of home. The naan is made fresh in their tandoori ovens on site and you can even watch them through a window. My favorite dish is their Butter Chicken and my husband likes their hotter dishes – a lamb vindaloo or madras. The poppadums are also delicious as an appetizer. 21 Steps Kitchen and Bar has become a favorite over the last few years. 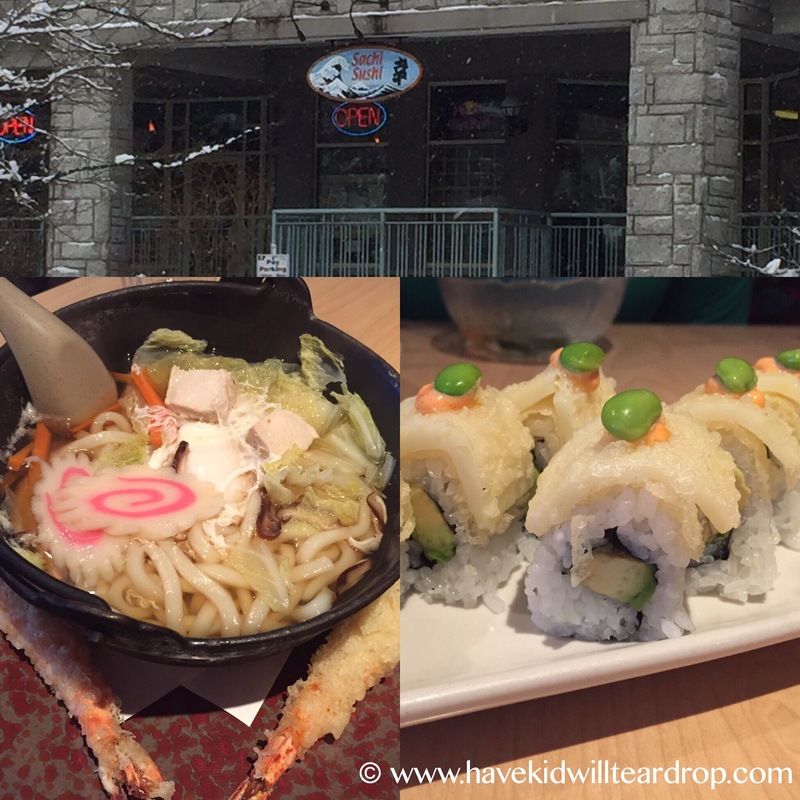 This casual dining place has food for everyone, a full bar and fun atmosphere. I have always loved their smoked salmon pasta and my son and husband have changed up their orders over the years. The food is always good and over the holidays areservations are strongly recommended. My son and I love to do a date day were we do an activity in the village and then have lunch at Crepe Montagne. This place is a tiny little restaurant and seating is very cozy. 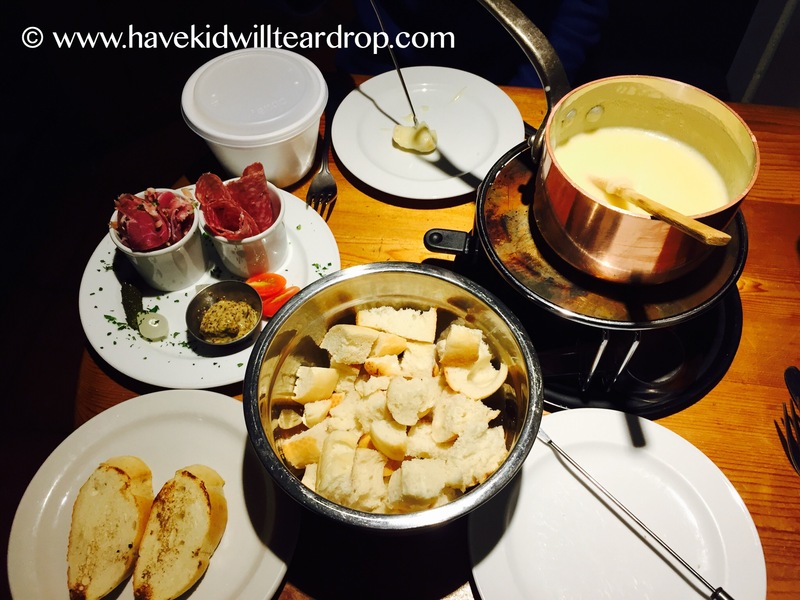 They specialize in food from the Alps – think fondue, Raclette, charcuterie, and crepes of all types. The food is delicious and lunch time is an easier time during the holidays to get a table. Dinner means waiting a long time, especially if you don’t have reservations. Whoola Toys is our favorite place to go to pick up new games or spend some of the freshly received Christmas money. 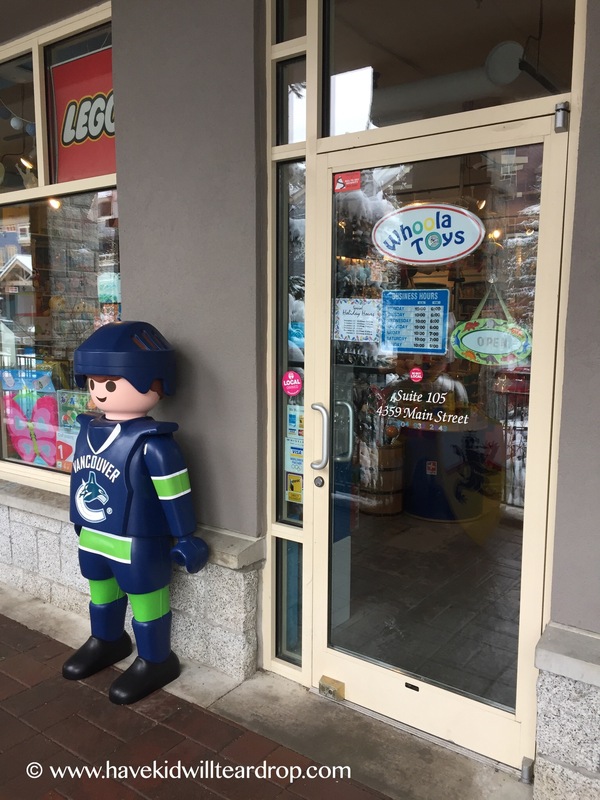 It is a small store packed to the rafters with toys for kids of all ages. We get in there at least once a trip and always find something we can’t leave without. This usually comes in the form of games or puzzles (which there are loads to chose from!) but there are also great activities for kids and toys for all ages including Lego, Brio, Playmobile and other really big brands. I also like that they offer a small selection of local items. We came away with 4 new games (a Traveller size Catan and 3 card games) that all 3 generations will enjoy playing together this week (and in the future). There are lots of toys out for kids to play with and it is just fun and inviting in the shop. Families will love it! Armchair Books is another favorite stop for us, as we LOVE an independent bookstore. This is a cozy space with a wide variety of books right in the heart of the village. We never seem to pack enough books and popped in to get some books we don’t have access to Oregon. The children’s section features picture books, graphic novels, mid-level readers, young adult and a good selection of non-fiction. We had to be reasonable about how many books we were getting. They have a loyalty program as well, so if you remember to bring your card back on future visits they will stamp it for you and you will receive a discount (the discount is the average price you spent at the store after buying 10 books…for us, this is not a hard goal to reach even on vacation!). The Beach is a spot I discovered when I forgot my swim suit at home and desperately needs to get my sore muscles in a hot tub! They have an amazing selection of suits and being of the “over-40” set I didn’t feel like things were too young for me. There is a wide variety of prices as well, and the staff has always been very helpful when I have gone in. They also carry a favorite swim suit brand of mine – Sea Folly. Last year I discovered a shop called Peak Performance. This is a clothing company out of Sweden and they haven’t made it to the US yet (from what I have found). I LOVE their base layers for skiing. It is a luscious, soft, fleecy wool that keeps your body oh so warm! I wear them around at home a lot too. I just love the clothing. The majority is wool based for their casual clothing line and their base layers. They have a great selection of outwear using Gore-Tex fabrics for adults and kids. The colors are beautiful and while the clothing is on the higher end price wise, it lasts for ever! 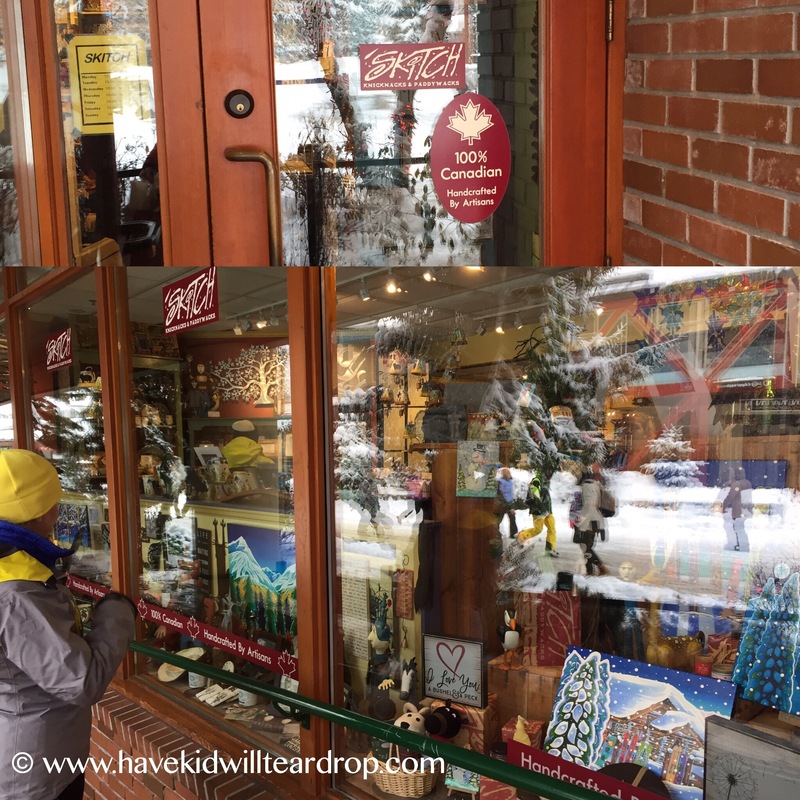 My absolute favorite store in all of Whistler is Skitch. This story features beautiful paintings, art of all types, metal work, signs, kitchen items, and more that all are made by Canadian artists, many of whom live in the area (or in BC). My favorite artist in the shop is Cori Ross. Her prints and giclees are absolutely joyful and fun. We have several at home and I fall in love with more every time we come to whistler. This is a must stop for anyone that needs or wants something truly special! 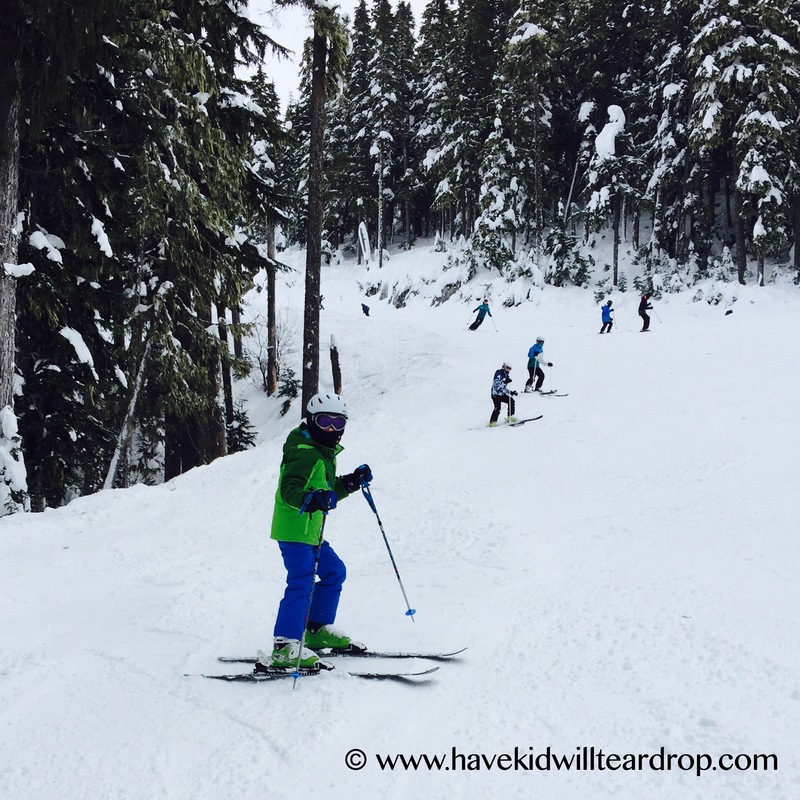 Skiing is the main reason we come to Whistler. We love the terrain that both Blackcomb and Whistler offer and you can’t beat the vertical feet that is there for the taking. The majority of our time is spent on the mountain during our visits where we feel the world slide away as our skis shoosh down the mountain. If you are a resident of Oregon, Washington or Canada your best option for tickets could be Whistler/Blackcombs Edge card. This offers deeply discounted rates on the daily ski passes. The pass also allows you to attach a credit card so you can just take that on the mountain with you and you can use it to make purchases. An additional benefit to this pass and the season pass is that it can be attached to your account on WB+ and you can check your daily stats which is pretty fun. If you are coming from other states, there are ways to save money on your lift tickets. You can go through Liftopia for deals or we used to stop at the 7-11 and buy day passes at a discount in Squamish. On days we aren’t skiing we like to hang out sledding or skating in the village. The Whistler Olympic Plaza is the place to go for skating. The rink is open all day (starting at 11a) outside of a couple of hours where they are doing some maintenance on the ice. Check their website for times though just to be sure. One of the great things offered at the rink are these great walker-like contraptions that people can use to get their balance with out doing too much damage to their pride or back side. I think they are really meant for kids since they are on the shorter side, but I found it helpful to get my skate feet back under me after a nice long hiatus. Skating is free if your bring your own skates, otherwise rentals will run you about $7 for each pair of skates. There is a small sledding hill for kids to bring their sleds right next to the ice rink. Lots of snow has been piled up and chutes formed into the hill so the sleds are guided down the small slope. There is a good runout at the bottom. For both all of the activities mentioned, helmets are highly recommended. Next to the sledding hill is the gorgeous playstructure. 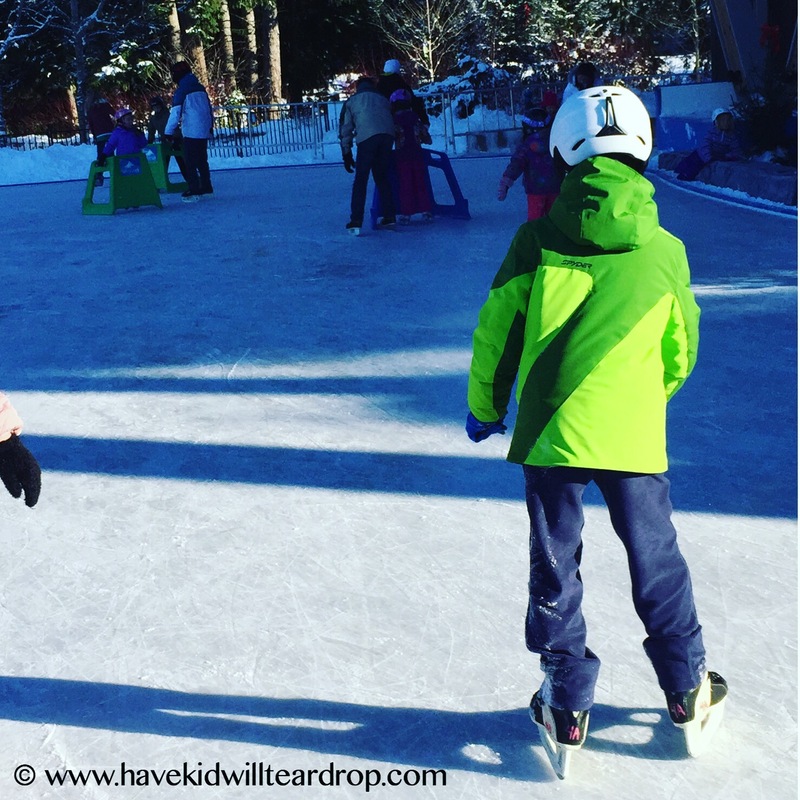 It is not maintained in the winter and can get quite slippery, but it doesn’t stop the kids from having fun. In my travels I have had an amazing opportunity to visit a couple of spas. In Whistler I have tried the Scandinave Spa and the Taman Sari and these two are my favorites and both very different. Scandinave Spa is up the highway towards Pemberton, just outside of Whistler. This spa is set among the trees yet feels really secluded and away from everything. They offer full spa services but what makes them special are their special soaking pools, saunas and steam room, and relaxation rooms. They spa is open year round and offer different packages. You can just go in for the baths which tout themselves as hydrotherapy helping with circulation and endorphin release. The spa requires folks stay quiet so the mind can also rest. It is a wonderful few hours spent in a gorgeous setting. There is a cafe onsite in case you get a little hungry too! Taman Sari Royal Heritage Spa is my other favorite. I have visited the spa in the Hilton, but there is a second location at the Summit Lodge and Spa as well. This spa is a really lovely experience with a variety of treatments. Moms and dads who need some relaxation time or sore muscles tended to will love the attention they get here. The experience starts with cookies and tea in the waiting room. You are then shown to the changing rooms, where you are given a robe and slippers and then taken to your treatment room. They do treatments that are inspired by the Javanese and Balines spas in Indonesia. The smells are amazing and you come our feeling amazing. It is more expensive than treatments I have at home, but I often get a treatment here as a special Xmas gift.